Worship at First Parish is designed according to monthly themes. We coordinate the stories offered in worship on Sunday mornings with our Children’s Church theme, and adult enrichment programming. We have a weekly “Faith In Action” offering in our worship service which features a testimony from a congregant about how our faith impacts her/his life. The year-long arc of worship will touch on: “Who Are We Together”. Each month we will explore a spiritual theme to deepen our knowledge of each other’s faith journey and that of the church at large. 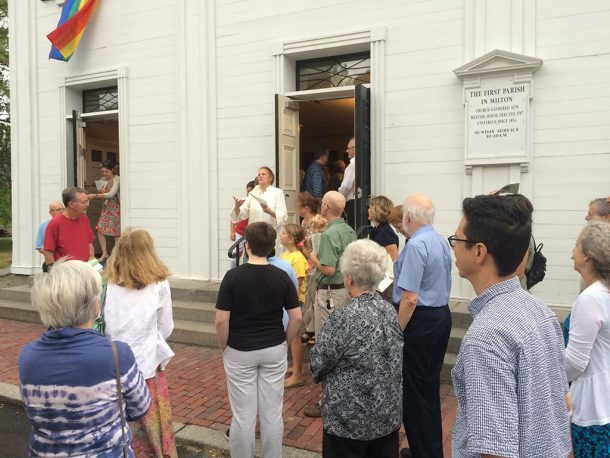 We worship in the Meetinghouse each Sunday at 10:30 a.m. from September to June. We honor the living legacy of our faith in the human potential for goodness and in the God of limitless love, in whom we are one. To walk together in peace, committed to justice and compassion in our world.